From Canada to Argentina, preparations are well underway for the Continental Day of Action Against Canadian Mega Resource Extraction on August 1. Participating organizations’ demands range from divestment to putting people before profit. Communities and organizers resisting extractive industry projects in Latin America continue to face displacement, harassment, threats, and death, often dismissed as part of unrelated violence and conflicts. VANCOUVER—From Canada to Argentina, preparations are well underway for the Continental Day of Action Against Canadian Mega Resource Extraction on August 1. 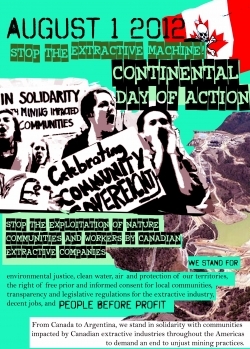 Dozens of organizations have signed a call for the day of protest in solidarity with communities impacted by Canadian extractive industries. The event is meant to highlight the dominance of the Canadian mining industry worldwide. Their demands range from divestment to putting people before profit. But some activists in North America argue that the serious repression accompanying Canadian mining around the world requires going further than those initial demands. They say that acknowledgment, a sense of urgency and a deeper strategic analysis for concrete local action are also needed. Communities and organizers resisting extractive industry projects in Latin America continue to face displacement, harassment, threats, and death, often dismissed as part of unrelated violence and conflicts. Decentralized actions will be taking place throughout the western hemisphere on Wednesday, including a national day of mobilization in regions of mining conflict in Colombia, a memorial in Vancouver to remember those who have lost their lives opposing mining projects and a rally outside the Canadian Embassy in San Salvador. The National Roundtable Against Metallic Mining (Mesa Nacional Frente a la Minería Metálica) in El Salvador, comprised of community-based groups affected by mining as well as environmental and other organizations across the country, will be actively participating in the day of action. Vidalina Morales spoke with The Dominion from her home in the department of Cabañas, El Salvador, where Vancouver-based Pacific Rim’s plans to develop a gold mine have been fraught with controversy. “We’re going to rally in front of the Canadian Embassy here in El Salvador,” said Morales, adding that there will also be a press conference on site. Over the course of the Roundtable’s actions and campaigns, many affiliated organizations have faced ongoing human rights violations, particularly in Cabañas. The community-based resistance to the Pacific Rim mining project in Cabañas has suffered extreme repression, including murders of several active community organizers and activists from communities in the vicinity. Earlier this month, 19-year-old engineering student David Alexander Urías was murdered in the community of Palo Bonito, says Morales, only a few kilometres from Pacific Rim’s operations. His murder has been reported as being gang-related, but Morales says local community organizers suspect otherwise. “Because we continue directly in the region where we’re in conflict and where the company has shown so much recent interest in mineral exploration, we’ve seen some things that seem surprising to us—when families that have been longtime supporters of our efforts are attacked. Here in this department where we live, a youth who was only 19 years old [David] was recently murdered—a young student who is the son of a woman who has been very involved in this struggle,” she said. “Here, anything that happens, they always blame it on the gangs, because it’s the easiest way to deny links to other things,” said Morales. In Colombia, murders, threats and other repression against individuals and communities facing large-scale mining activities around the country take place amid an ongoing armed conflict. Mario Valencia, a member of the Colombian Network Against Large-scale Transnational Mining—RECLAME—spoke with The Dominion via telephone from Bogotá, where preparations for the August 1 day of action are in full swing. In Colombia, a national day of mobilization “to stop the mining-energy locomotive” is being organized, coordinated by an alliance of unions, communities, and organizations, including the National Confederation of Miners and RECLAME. Rallies, marches, carnival-style parades and cultural festivals will be held in over a dozen different departments, all regions where there are mining conflicts. In Caldas, for example, actions will denounce the displacement of communities to make way for Canadian company Gran Colombia Gold’s Marmato mining project, says Valencia. “Mining is one of the principal activities in the Colombian economy. The government’s idea is that Colombia should be a mining country, so the most important issue is territorial defense. We have proposed to take this on as the defense of life, the defense of water, the defense of territory, so that these transnational companies can’t find the conflict, the pretext to enter these regions,” he told The Dominion . Valencia says that organizations in Colombia realized that they would not be able to confront the mining policy alone—a mining policy imposed on the country from outside but fiercely adopted by the Colombian government. Some of the sectors that have joined forces against transnational mining in Colombia may not seem like natural allies to some people, he says, given that they include communities resisting mining, mining and energy sector workers, small-scale miners and environmental organizations. Root Force, a campaign based out of Tucson, Arizona, also connects environmental, social and other justice issues, through a strategic anti-infrastructure approach to solidarity with communities in Latin America resisting extractive industry projects. Root Force has signed onto the call for the Continental Day of Action, although concrete actions are left to the discretion of the various autonomous collectives and affiliate groups scattered throughout the southwestern US, the pacific northwest and beyond. “The sort of broader goal of Root Force is to help bring down this global economic system that is at the root of the various injustices that so many of the environmental and social justice groups are organizing against,” Ben Pachano, an organizer with Root Force, told The Dominion in a telephone interview. “The method that we’ve identified for doing that is by preventing the expansion of this resource extraction and transportation infrastructure that underlies the system. “The actions that Root Force promotes and that, you know, our affiliate and allied groups take are aiming toward that ultimate goal, which is itself an act of solidarity, because the idea is that oppression of an Indigenous community resisting a mine, say in Guatemala, is coming in large part because of the demand for that metal in the first world,” said Pachano. The organization provides resources to facilitate connections between like-minded groups, to raise awareness about struggles against extractive and infrastructure projects in Latin America and their connections to the US, and to promote effective strategic action at the local level. “Because of that sort of interconnected nature of basically a globalized capitalist economy, that means that you don’t necessarily need to be in the place where the resources are being extracted to take actions affecting that extraction,” he said. In Canada, home to companies that together own over 3,000 mining projects around the world, actions are planned across the country. In Toronto, where many corporate headquarters and the Toronto Stock Exchange are located, people will mobilize at Queen’s Park. In Vancouver, another city with a huge number of mining company offices, the local Mining Justice Alliance is hosting a memorial action outside of Goldcorp’s head office. Latin American communities spearheaded the Continental Day of Action, but the Vancouver action is also in solidarity with communities in Asia-Pacific, in Africa, locally and around the world, Mining Justice Alliance member Beth Dollaga told The Dominion . She is also a founding member of Canada-Philippines Solidarity for Human Rights and sees the same patterns of extraction and repression that occur in the Philippines happening elsewhere as well. Paramilitaries around the world are often trained not just to protect corporate infrastructure, she says, but also to harass communities resisting mining and people who speak out in support of community resistance. “We know that the aggressive extraction—mining—it’s not just the environment plundered or killed, but also mostly Indigenous people, because this happens in the remotest areas of places, like in Latin America or anywhere in Asia-Pacific. So most of these places are actually the Indigenous ancestral domain. And people are killed,” she said. “Part of this event is also to remember them. And to continue. It’s not just remembering those people, those martyred activists, but also to carry on and pick up from [where they left off], in solidarity from wherever we are,” said Dollaga. Dollaga is not the only one to recognize that solidarity organizing with resistance to Canadian extractive projects is often a matter of life or death for people from affected communities. Pachano also emphasizes that for many, it is a fight for survival. Sandra Cuffe is a Vancouver-based freelance journalist.